With two different types of frosting -- Rich & Creamy and Whipped -- available in delectable flavors such as butter cream, milk chocolate and coconut pecan, Betty Crocker ready-to-use frosting serves as a convenient way to ice a cake, cupcakes or cookies. Even if you've never used Betty Crocker frosting, you can make your icing projects look neat and professional with just a few tips. After you open the Betty Crocker icing container, stir the contents with a spoon, spatula or knife to diminish the air bubbles in the frosting that occur during packing. Stirring will also make the icing less stiff and more spreadable, which will reduce your chances of tearing the cake while applying the frosting. If you choose not to stir, you can smooth the icing with a spoon, knife or spatula after applying it to the confection. Once you spread the icing on the dessert items, you'll want to keep it in place. 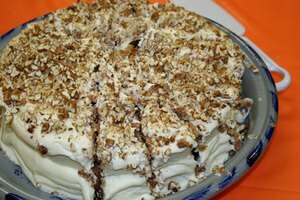 Avoid applying the icing to desserts that are warm from the oven or it may slide off. Allow the confection to cool completely before you ice it. Store the iced items in a covered container or cover them loosely with a piece of plastic wrap. Avoid tilting a multilayer cake when cutting or serving, because if the frosting between the layers is slick the layers may slide apart. If you don't need all of the icing, store it for later. Don't layer too much onto the dessert. 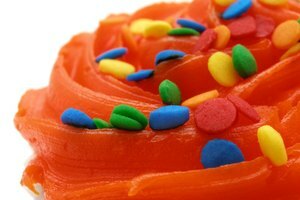 If you want an color icing that Betty Crocker does not offer, add food coloring liquid, four or five drops at a time, stir and check the results before adding more. If you are using a paste form of coloring, add a pea-sized amount at first, stir and check the effects. Liquid will provide lighter, more pastel, shades, while paste will lend a deeper hue to the icing. If you want to create a glaze from canned icing, put 1/3 cup in a saucepan or microwave safe bowl for three dozen cookies or 2/3 cup for a cake. Heat the icing on the stove top while stirring until it becomes thin enough for glazing. 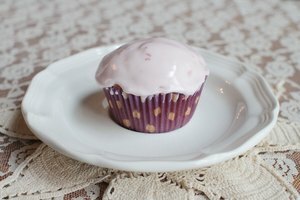 In the microwave, heat 1/3 cup of icing for five to 10 seconds on "High" and 2/3 cup for 10 to 20 seconds on "High" or until the icing is thin enough for glazing. Betty Crocker's Whipped frosting may be piped through a pastry tube, but don't try it with the Rich & Creamy variety. If you have some icing left over after frosting your dessert item, you can replace the lid on the original container and store it in the refrigerator for up to two weeks. After two weeks, discard any unused portion. 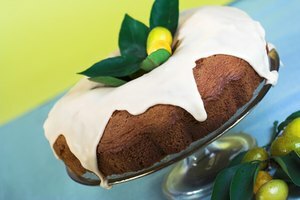 The Betty Crocker website states that after being exposed to air, the frosting may be more creamy, but is still safe to eat.